Born in Birmingham, Alabama in 1938, Juanita Millender McDonald was an educator and member of the United States House of Representatives. She received a bachelor’s degree from the University of Redlands and a master’s degree from California State University at Los Angeles. Millender-McDonald taught in the Los Angeles School District, and was the editor of Images, a textbook designed to improve the self-esteem of young women. As director of gender-equity programs for the school district, Millender-McDonald received national recognition when she served on the National Commission on Teaching and America’s Future. In 1990, Millender-McDonald became the first African-American elected to the Carson City Council. She was elected mayor pro tem for Carson in 1991, and won a set in the California State Assembly in 1992. Millender-McDonald announced her candidacy for the U.S. representative of California’s Thirty-Seventh Congressional District after Representative Walter R. Tucker III resigned. She defeated eight other candidates in the March 1996 Democratic primary, and ran unopposed in the general election. She was sworn into office in April 1996, and was reelected to five terms. 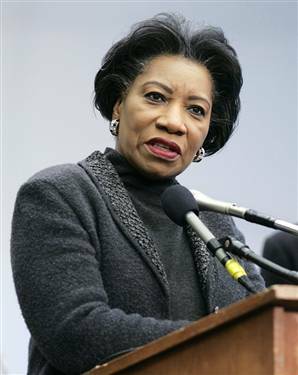 Millender-McDonald was a member of the Congressional Black Caucus and served on the House Committee on Small Business, and the House Committee on Transportation and Infrastructure. She was also the first African American woman to chair the Committee on House Administration. In the House, Millender-McDonald had a liberal voting record. She worked on issues which included election reform and genocide in Darfur and Cambodia. She also worked with Secretary of State Madeleine K. Albright and Ambassador John Miller on human trafficking and women’s rights issues. Millender-McDonald drew national attention in 1996 when she had then-CIA director John Deutch address the community of Watts, California, about allegations that profits from domestic sales of crack cocaine were funneled to the CIA-backed Contras in Nicaragua. Throughout much of the first decade of the 21st Century Millender-McDonald was named one of the 100 Most Influential Black Americans by Ebony magazine. Juanita Millender-McDonald died of cancer on April 21, 2007. She is survived by her husband James and five adult children.